Every single week, 2 men in England and Wales make a choice to kill their current or former partner. Despite the fact that these men consistently have a history of domestic violence, the media insists on reporting comments from random neighbours claiming that these men are 'caring fathers', 'loving brothers', 'quiet neighbours', and, as above, 'non violent'. Men who choose to kill are violent. It's pretty much the definition of the word since murder is an inherently violent act. As a culture, we refuse to recognise that coercive control is a choice made by men who believe they are entitled to own women and children, and that men who kill are not aberrations, but representative of the consequences of patriarchy. Family members and neighbours frequently do not see the violence women are forced to live with. Perpetrators tend to be highly manipulative and very careful with their behaviour around other people. It's not at all uncommon for close family members and friends to have no idea just how violent a man is. Publishing these types of quotes without making the context of how perpetrators operate clear obscures and elides the reality of male violence against women and children. This is particularly important in the context of Peel suggesting Michael was incapable of dealing with confrontation as it implies, once again, that Michael had no choice; that he lacked the skills to recognise Nicola as a person and so was forced to kill her. It is utterly irresponsible for The Guardian to have published this statement. 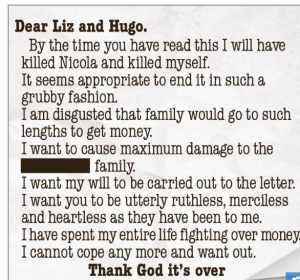 This is a copy of Michael's suicide as it was published in The Sun (who themselves concentrated on the Beck's financial status rather than the murder, because it's more important to note that Michael was rich rather than recognising the life of Nicola). Generally, we do not support the publishing of suicide letters. We have made an exception in this case because the letter is not only a suicide letter but a defence of murder. "I have spent my entire life fighting over money"
Yes, Michael was a stockbroker, but this quote is in relation to his marriage and not his career. It is not normal to spend one's life "fighting over money". The Guardian do quote the assistant Devon coroner, Lydia Brown, who makes it clear that financial control was part of the motive for this murder, without contextualising financial abuse as a form of coercive control. 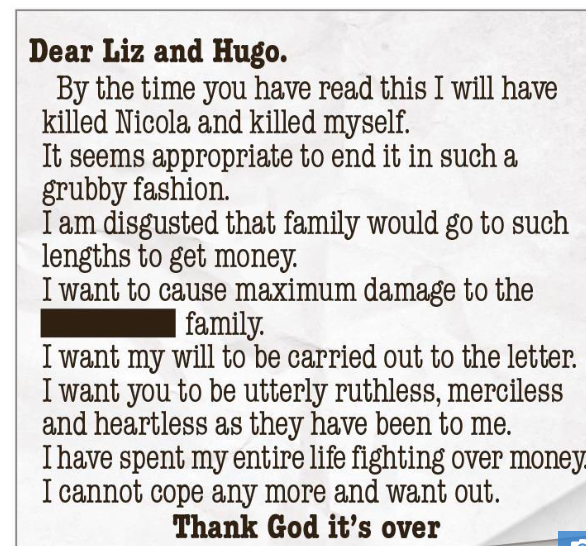 This is without the issue of Michael defining murder as 'grubby' and demanding his family punish Nicola's family. Where the Guardian truly failed was at the end of the article. They included the hotline phone number for the Samaritans (116 123, UK) but did not include the National Domestic Violence Hotline (0808 2000 247). The Samaritans media guidelines make it absolutely clear that the number should be included in any media coverage of suicide, but this was not just a case of suicide. 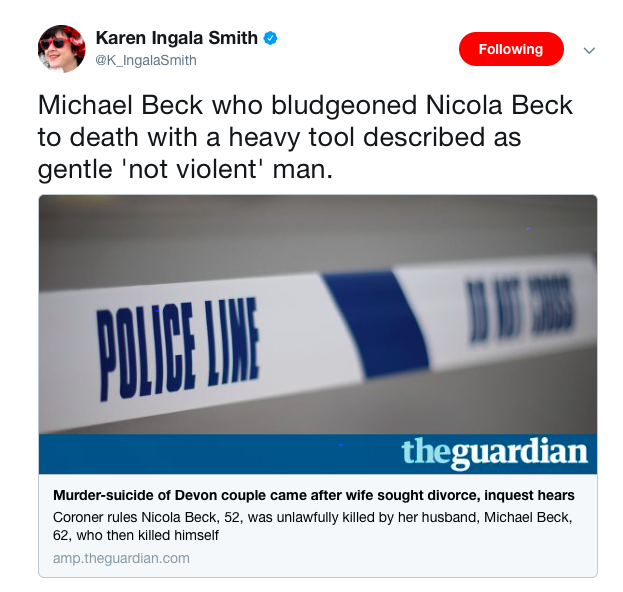 Michael Beck clearly had a history of domestic violence and this was a murder where coercive control was a defining factor as Michael felt justified in killing Nicola because she tried to escape his abuse. The feminist organisation Zero Tolerance have written a comprehensive media guideline for reporting violence against women and girls that require the inclusion of the National Domestic Violence Hotline. Granted, Zero Tolerance's guidelines are 42 pages long, however the The National Union of Journalists have written a 3 page media guideline on reporting violence against women and girls for those journalists unwilling to take out 15 minutes of their day to do some basic research. The NUJ make it very clear that it is essential to include the National Domestic Violence Hotline.